We encountered the issue where the OOTB approval workflow stopped with the error message “The workflow could not update the item, possibly because one or more columns for the item require a different type of information”. You can republish the worfklow with an account that has sufficient permissions for the library but who is also working. The previous version of the workflow has been started a few times before we could resolve this issue where you can use the below script to retrieve the items where the previous version of the workflow is current in progress. 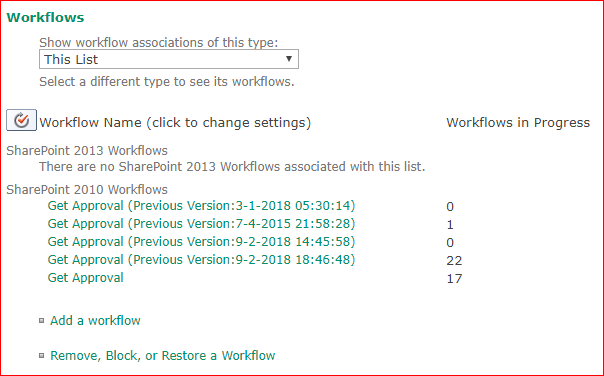 First find the workflow name by going to the workflow settings on the specific library. Next run the following script in the SharePoint Management Shell as administrator where you will need to add the web url, list title and previous version date.